We invite you to join our East Northport Jewish Center family. We offer a vibrant community of congregants, clergy, and staff who enrich each other’s lives through times of joy as well as in times of sorrow. The ENJC will create meaningful experiences for you through worship, learning and caring, as you develop life-long friendships with our members. 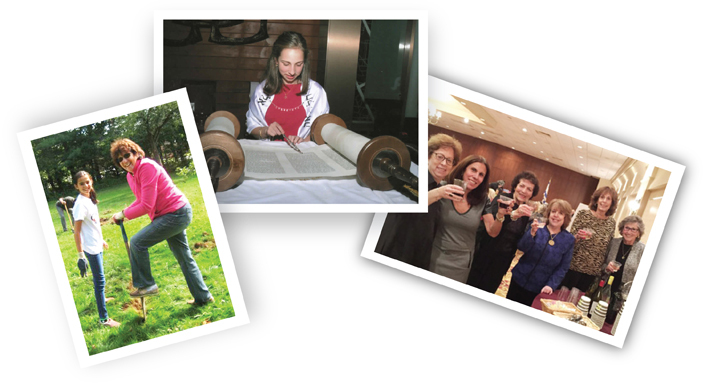 We welcome you to experience and expand your part in our synagogue life with our many opportunities to connect with the Jewish community while exploring your cultural heritage. We are a congregation of diverse ages and backgrounds; there is a place for everyone at the ENJC–The warm and inviting Haimische Shul. Members receive High Holy Day assigned seating for adults and children through age 22. Additional guest tickets may be purchased for family members. Free babysitting as well as age-appropriate religious school and teen services provided. featuring upcoming synagogue and community events. We offer several levels of membership dues based on family, individual and age status. In addition, we require members to pay a building assessment. Those with special financial needs may request reduced memberships. No one will be denied membership because of an inability to pay dues. All such arrangements are handled confidentially. For our schedule of fees, please click on the link to the right. Our synagogue is a warm, haimische, close-knit community, open to all and offering a myriad of opportunities to participate and get involved. In addition to our services, minyans and holiday events, we have classes, programs and volunteer activities throughout the year. For me, ENJC is not merely a job, but an opportunity to create a sense of extended family. We would love for you to join with us and become an extended part of our family. Years ago, when searching for a Jewish community, my family was lucky to find the ENJC. Our shul is a warm and welcoming congregation, and it quickly became a second home. We have found opportunities for social connections, as well as worship and learning. At the ENJC, we are encouraged and supported in our journeys to Jewish expression. I am certain there is something here for you. I hope you will consider joining our family!